This is a rather hard blog article for me to write for two main reasons. Reason number one is that I am an admitted Republican, and number two because I really don't want this blog to turn into a political blog. So just to be clear, even though I am leaning more towards the McCain/Palin ticket, I am perfectly okay with you voting for Obama/Biden. 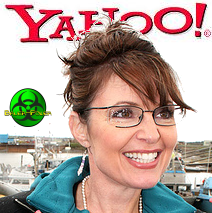 Anyway, enough with the preamble, so I was driving in this morning and I heard on San Diego's Mikey Show that Sarah Palin's Yahoo email address got hacked! WTF!?!? When I got in this morning I decided to check into it, and according to the Associated Press, Palin was using a Yahoo account for official business as Alaska's Governor. Yahoo email for official business? Oh Really? That is a little disconcerting considering the sensitive nature of government correspondence even at the state level. This is a shocking invasion of the governor's privacy and a violation of law. The matter has been turned over to the appropriate authorities and we hope that anyone in possession of these e-mails will destroy them. According to The Guardian, "The hack has been attributed to an activist group known as Anonymous, a loose grouping of internet pranksters, vigilantes and anarchists that has previously locked horns with scientologists and internet paedophiles." Now this doesn't really sway my vote at this time as I am certain that presidential/vice presidential correspondence WILL NOT be done through a public freebie email service like Yahoo. However it does have me seriously asking, "Sarah, WTF were you thinking?" What's your take on this? If you were going to vote the McCain ticket, does this sway your vote? If you are an Obama fan, does this just help to strengthen his cause? I am curious to know your thoughts on this one.